Journalist, commentator and chair of the Journalism Department at Kwantlen College, Frances Bula writes for a variety of publications. I’m sitting in a restaurant with my friend Frances. 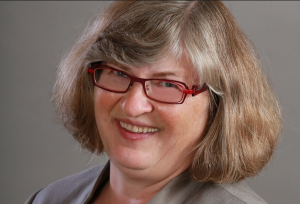 A longtime print journalist and frequent guest on radio public affairs shows, she is knowledgeable, articulate and funny – in both of Canada’s official languages. At the moment, however, she’s on the verge of turning down an interview request. The radio producer wants her to come on air to talk about a recent decision related to disruptive taxi company Uber. But Frances didn’t cover the decision and hasn’t really paid much attention to the issue. So she’s about to say “no” to the interview. The problem is, I’m sitting right there! She’s heard me lament the fact that women frequently give up opportunities to provide their informed analysis because they think they’re “not the best person,” and knows I’ve spent the past five years trying to motivate them to respond differently. Plus, having spent three decades as a reporter herself, she also knows how often journalists on deadline default to male sources who don’t hold themselves up to such an unrealistic standard. And she’s clear about the depth and value added to a story when it features comments from a variety of perspectives. Now the truth is, I’m not paying attention to the conversation she’s having across the table with the radio producer, because I’m otherwise occupied. So I wouldn’t actually have known to take her to task for turning down the opportunity, unless she’d confessed to me afterwards. As for the next time someone calls you, I’ll have even less chance of knowing that you’re being asked to weigh in. But don’t let that stop you from sharing what you know. Take a page from Frances’ book, and consider how the knowledge you have might intersect with the topic they’re featuring. Offer to provide context and analysis that – while it may not focus on the precise angle being pitched to you – will still enlighten listeners or viewers or readers. Your male colleagues do this all the time. The information they share often makes a valuable contribution, enhancing people’s understanding of important issues. No doubt yours will, too. And in the process, it can position you as an authority likely to be contacted for future stories or speaking opportunities that expand your ability to have an impact on issues you care about. All I can say is, YESSSSS!!!! . When I worked as a reporter, I often needed people to comment on a topic, and quite bluntly I didn’t care how qualified they were. I just needed quotes, and a variety of opinions, to make my story. What was essential was that the ‘sources’ I contacted were able to respond quickly, because on a daily paper there are daily deadlines. Sources who responded promptly got the quotes in my story, those who called back after deadline didn’t. Those who responded quickly got a call from me the next time, too. I can think of one example — a certain business school professor I know from my MBA days — who gets quoted in a huge range of business stories. He usually says what’s obvious, but the reporter just needs someone to quote, and this prof gets back on interview requests quickly — and apparently is willing to talk whatever the topic. Just my two cents’ worth. As long as you’re reasonably qualified on the topic, and getting quoted will meet your purposes, grab that interview.